Here's something to wear that is very different and super cute! 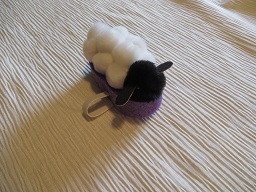 Kids will love wearing this sheep wristband and will have their pet with them everywhere they go! 1. Cut a 1 inch slice from a pool noodle so it looks like a one inch thick donut. 2. Using pointed scissors, make a slit from one side of the donut into the middle hole. 3. Directly across the donut shape, make another slit so the slits would meet in the middle. 4. Use a large safety pin to pull the elastic through the slits. Make sure you don't twist the elastic when you insert it. 5. Tie the ends of the elastic together - the ends have to be in the hole so the knot you tie is in the center of the donut. You'll have to put this on the arm of the intended wearer to see if the elastic needs to be tied shorter. If the ends are long, cut them off. 6. Then pinch the donut shape and pull elastic through each side of the donut to make the donut skinny - make sure the knot still stays in the middle of the donut hole. Use a hot glue gun and insert some hot glue into each slit beside the elastic to make sure it stays in place. 7. Glue 3 of the white poms along each side of the top of the skinny donut. The top row needs to be set back some to allow space for the large black head pom. See photo. When the body and the head are in place, cut out small ears from the art foam, and glue into place. Its ready to wear - you'll find this comfy, because the foam tends to be warm while you're wearing it. 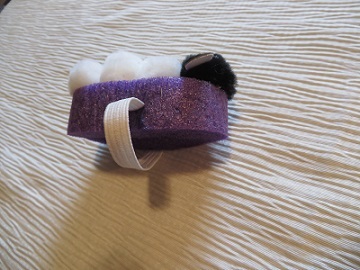 I also made a dog and bunny wrist band - they are purple also, since that's the color I had to work with when making up the designs. Hi Jeanine! How creative! I've never seen anything like this before. My daughter would love wearing this. Thank you for sharing with us!